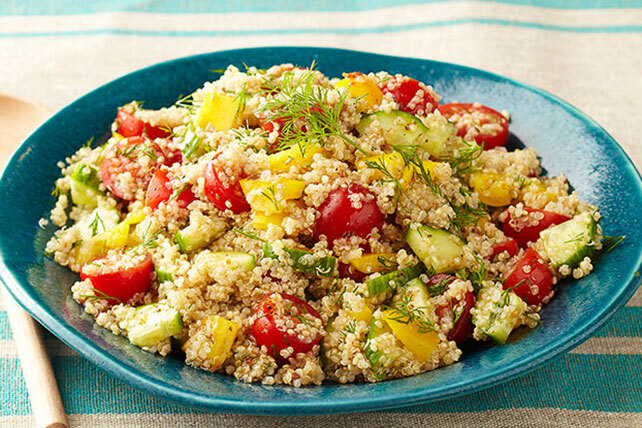 Our Greek Quinoa Salad is a better-for-you side dish, chock full of quinoa and farmer's market vegetables. The perfect salad for a party or potluck, get started with our make-ahead tip! Bring water and quinoa to boil in saucepan on high heat; cover. Simmer on medium-low heat 15 min. or until liquid is absorbed. Cool slightly; fluff with fork. This colourful salad, made with a variety of foods, can fit into a healthy eating plan. And as a bonus, the yellow pepper provides a good source of vitamin C.